WASHINGTON, DC – For the third year, President Donald Trump failed to properly condemn as ‘genocide’ the Ottoman Turkish government’s annihilation of millions of Armenians, Greeks, Assyrians, Chaldeans, and other Christians in his annual April 24th commemorative statement. WASHINGTON, DC – The Armenian National Committee of America (ANCA) Executive Director Aram Hamparian offered the following comment regarding this week’s U.S. House Democracy Partnership visit to Armenia. WASHINGTON, DC – Lead authors of the Armenian Genocide Resolution in the U.S. House – Reps. Adam Schiff (D-CA) and Gus Bilirakis (R-FL) – pledged to press for passage of their bipartisan legislation during a standing-room-only Capitol Hill Armenian Genocide Observance that gave voice to the growing bi-partisan Congressional consensus against Turkey’s Armenian Genocide gag-rule. WASHINGTON, DC – Thirty-five U.S. Representatives today joined with Congressional Armenian Caucus Co-Chair Frank Pallone (D-NJ) in calling upon Chairwoman Nita Lowey (D-NY) and Ranking Member Hal Rogers (R-KY) of the House Appropriations Subcommittee on State-Foreign Operations to back a $100 million Fiscal Year 2020 aid package for Artsakh and Armenia, reported the Armenian National Committee of America (ANCA). 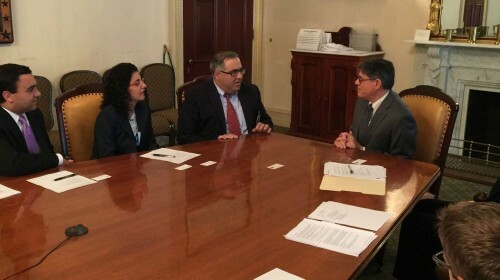 The ANCA met with Treasury Secretary Jacob Lew to personally thank him for leading President Obama's April 24th delegation to the international Armenian Genocide Centennial remembrance ceremony in Yerevan, and also to discuss the Treasury Department's role in the further growth of the U.S.-Armenia economic relationship. Members of the ANCA San Fernando Valley North Chapter, constituents, and ANCA Western Region representatives have a productive and educational meeting with Representative Steve Knight. Join the ANCA in calling on the U.S. House Ethics Committee to publicly release the Office of Congressional Ethic's findings on Azerbaijan. Just call the Committee at (202) 225-7103. Use the ANCA’s March to Justice Armenian American advocacy tool to reach to your legislators on the issues you care about most – with a just a few clicks. Check out the ANCA Western Region’s innovative campaign to expand the Armenian American voice in the electoral process. ANCA WR Spotlight: America We Thank You! The ANCA Western Region spotlights the generosity by the American people and the efforts of Near East Relief in rescuing and providing assistance to hundreds of thousands of survivors of the Armenian Genocide.